Let the style and practicality of this Corliving low back bar stool spruce up your morning routine at the kitchen counter or evening routine having a drink with friends. Crafted with a contemporary style, it's sure to blend easily into a variety of kitchen decor. Adjustable in height, it makes an easy fit for any size counter or bar. The chrome base frame colour gives this piece a stylish vibe, perfect for bringing a touch of flair to any room. Give your kitchen counter or breakfast island a touch of style with this beautiful Corliving low back bar stool. You'll appreciate how well its contemporary design fits into any room in your home. Its stunning brown coloured base frame is surprisingly easy to match with other decor. A terrific addition to any kitchen counter or breakfast island, this beautiful Corliving low back bar stool combines top-notch design and durability for a truly timeless piece. Its contemporary look pairs well with a wide variety of rooms and decor styles. The adjustable height makes it an easy fit to any size bar or counter. The chrome base frame colour adds a fun style punch, and is surprisingly easy to match with many decor colours and styles. Beautiful in style and durable by design, this Corliving backless bar stool is sure to blend perfectly into your kitchen or dining area. You'll appreciate how well its contemporary design fits into any room in your home. Easily adjust the seat to match this chair with any size bar or counter. Styled with a modern chrome coloured base frame, it fits seamlessly into many trendy decors. A terrific addition to any kitchen counter or breakfast island, this beautiful Corliving backless bar stool combines top-notch design and durability for a truly timeless piece. You'll love its contemporary style, perfect for any room in your home. Easily fit this adjustable chair to any size counter or bar. The chrome base frame colour adds a fun style punch, and is surprisingly easy to match with many decor colours and styles. 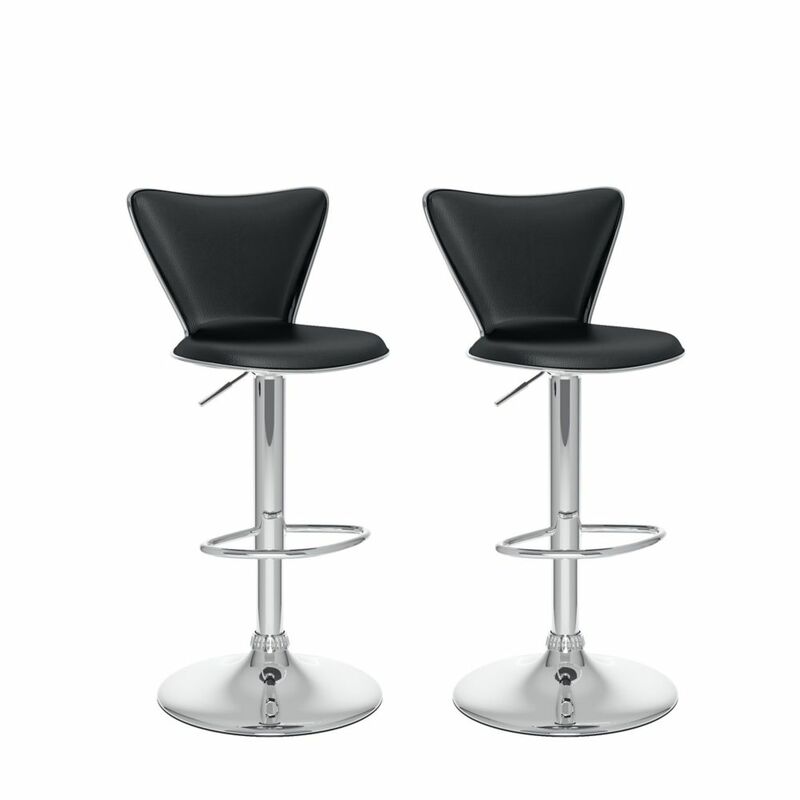 B 207 UPD Metal Chrome Low Back Armless Bar Stool with Black Faux Leather Seat - Set of 2 Let the style and practicality of this Corliving low back bar stool spruce up your morning routine at the kitchen counter or evening routine having a drink with friends. Crafted with a contemporary style, it's sure to blend easily into a variety of kitchen decor. Adjustable in height, it makes an easy fit for any size counter or bar. The chrome base frame colour gives this piece a stylish vibe, perfect for bringing a touch of flair to any room.